Ahmed Hegazy is a teaching assistant in the Architecture and Urban Design Program. He is a graduate of the German University in Cairo within the same program. He has specialized in the Urban Design track, getting exposed, as a student, to complex contexts such as the city core around Maspero, informality in Athr-el-Naby, and the waterfront on the Island in Manial. Pursuing multiple interests, Hegazy focused also on building technology and technicalities, as he did his bachelor project designing the German Embassy in Cairo. He wrote his thesis on Photovoltaic cells. Hegazy has specifically been exposed to the rapidly growing construction and consulting market within Dubai, in the capacity of multiple internships on and off site. Ahmed is a teaching assistant in the Architecture and Urban Design Department at the German University in Cairo. He achieved his BSc in Architecture Engineering from Ain Shams University and is working on his masters. He is interested in parametric design, bio- digital architecture, biomimicry, building design optimization, and mainly the integration between nature and architecture in a programmatic approach. Ahmed El-Hozayen is a teaching assistant in the Architecture and Urban Design Program at the German University in Cairo. He completed his BSc in Architectural Engineering in 2010 at Cairo University. And later, he earned his master degrees in Landscape Architecture from Agrocampus Ouest, Centre d’Angers, France. Ahmad Maher is an Architect and Teaching assistant in the Visual Design Department in the Architecture and Urban Design Program at the German University in Cairo. He completed his BSc in Architectural Engineering in 2011 . He Completed his premasters in Faculty of Engineering Urban Design Department - Cairo University 2014 and he started to work with his Masters Thesis about “ The Overlap between the urban morphology of the Egyptian city as a type of urban fabric "comparative study between the manor Ezbet Abo Karn and city of Mannheim". His Experience mainly is in Design Development as he worked at Space Consultants , and According to his previous academic experience he Worked as a Teaching Assistant in Architecture Department – ELShourok Academy and 15 of May institute Architecture Department . He participated in several architectural competitions and won four awards in designing different kind of Spaces , and he is also Autodesk certified instructor ( ACI) And the only Sketch up Certified Instructor in Egypt. He was involved in co-organizing and participating in community workshops which is held in several Universities in Cairo (ADD-ACES_ECO). Ahmed Nasr is a teaching assistant in the Architecture and Urban Design department in the German University In Cairo , he completed premaster degree from Cairo University in Urban Design Department, he participated in several architectural competitions and won three awards in designing different kind of open spaces and he is also Autodesk certified instructor ACI . Research interests keywords : Urban Spaces, Urban Morphology, Urban Conservation, Rehabilitation Projects, Commercial Advertisements in historical places, physiological influences of colors and commercial advertisings techniques affecting building façades . Aliaa Maged is a master’s degree holding teaching assistant in German University in Cairo; she completed her master’s (2014) and undergraduate Architecture study (2010) in Cairo University. Her Master degree, titled “Listening to Children: Developing Skills through Play Space Design” is a participatory urban study on children’s play spaces. She also participated in “Learn Move Play Ground” workshop which was also a participatory workshop on children’s play spaces in Egyptian schools. Research interests include participatory design, urban design for children and socio-cultural influences on design of urban spaces. Aliaa has both teaching and design work experience; she worked in teaching since 2010, teaching design, building technology and introduction to architecture courses, as well as having experience in design offices working on residential and commercial buildings. Amr Fathy is currently a Teaching Assistant in The Architecture and Urban Design Program at the German University in Cairo. He completed his BSc in Architectural Engineering in 2005 at Helwan University. In 2015, he earned his Master’s degree entitled “Residential Urban Open Space as a Tool to Achieve Neighborhood's Sustainability”, Arab Academy for Science and Technology, Cairo. According to his previous academic experience, he worked as a Teaching Assistant at the American University in Cairo (AUC), Future University in Egypt (FUE) and the Arab Academy for Science and Technology in Cairo (AAST). In addition, he has another experience of working as an Architect and Urban Designer in several architectural firms such as Aga-khan for Cultural Services, RDSFA (Rami El Dahan & Soheir Farid Architects) for engineering consultants, Solutions for engineering consultants and The Arab Contractors, Osman Ahmed Osman & Co.
Research interests include sustainability, parametric design, urban open spaces, vernacular architecture, renewable energy and building technology. Amr participated in different workshops as Renewable Energy & Building Technology in the MENA Region, Tunisia and Renovating Down Town in El Gouna, Egypt. Moreover, he collaborated with Freie University of Berlin in International Workshops on Meteorological & Climatological Dimensions of Urban Planning. Amr published a paper in the 2nd international conference on: "Quality of Life, A Vision towards Better Future" in Egypt which was organized by Modern University for Technology and Information (MTI) in 2012. Heba Ezzat is a teaching assistant in visual design department under architecture and urban design program in the German university in Cairo. She has acquired her BSc degree from the German university in 2015 where she had been awarded a scholarship to do her bachelor project in Stuttgart University with professor Helmut Bott. Heba is interested in research regarding urban development and participatory urban design with a special interest in public spaces and their role in the development of cities. She is also interested and involved in vernacular architecture and building with earth. Heba is currently enrolled in a masters program in the German University concerning green public spaces in dense neighborhoods. Heba is passionate about projects that have a cultural and social impact, shown in her participation in projects like “learn move playground” workshop that focused on developing school courtyards in Cairo, and multiple internships in offices like Takween and Shehayeb consult, which focused on urban development projects in areas like Ezbet Khairallah and Sayeda Zeinab. Heba is also volunteering part of her time to participate in developing villages in Fayoum. Kareem Anwar is an architect and teaching assistant in the Visual Design Department in the Architecture and Urban Design Program at the German University in Cairo. He completed his BSc in Architectural Engineering and Environmental Design in 2014 at the Arab Academy for Science, Technology and Maritime Transport in Cairo (AASTMT). He also has UK certified-RIBA (Royal Institute of British Architects) Degree. Prior to his commitment with the GUC, Kareem worked as a part-time teaching assistant at AASTMT, in addition to his experience in working for several architecture offices. Kareem is involved and very interested in Visual Studies Fields. He has participated in different projects and competitions addressing the relation between architectural and visual arts, in addition to participation in several workshops during his study at AASTMT. Maha is a part time teaching assistant in building technology department, beside that she is working as a research assistant with Asst. Prof. Dr. Wafaa Nadim on a research project funded by STDF, The research focuses on the affordable and adjustable living and mobility for integrated urban systems in Egypt. In 2013 she earned her bachelor of science in architecture engineering from Cairo University. Maha has joined the GUC since June 2015 and before that she worked as a junior architect for more than one year with Prof. Dr. Nabil El- Hady the principal of Noon architects. 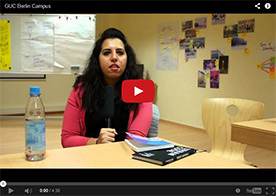 Merna is a Teaching Assistant in the Visual Design Department at German University in Cairo. Merna graduated from Architectural Engineering Technology Department, Credit Hours System, Faculty of Engineering, and Cairo University in 2013. She joined the academic career after her graduation as a part-timer in Credit Hours System, Cairo University. She finished her pre-masters courses in the Building Technology Department in Cairo University. She is currently working on her thesis under the title of “Dynamic Architecture”. She had worked for many architectural and constructional companies, such as Innovation Design Entity of Architecture and Alumeva for Constructional Works. During the five university years, she trained at more than seven different companies such as Dar El- Handasa, Architectural Design Group and Center of Planning and Architectural Studies. She also worked during her last year in college as a part-timer in Alumeva for Constructional Works. Merna is interested in Dynamic Architecture, the rotational mechanism of the architectural components, the Dynamic Facades, Responsive Skins, Intelligent Buildings, Home Automation and Smart Building System. Mina Ishac is a professional architect, and teaching assistant in the Architecture and Urban Design Program at the German University in Cairo. Mina obtained BSc in Architecture with honors (rank 6th) at Ain Shams University, in 2009. In bachelor class he joined a collaboration program with Landscape Architecture program in Clemson University to develop Rosetta’s master plan. Mina has previous teaching experience at the American University in Cairo in 2011, where he conducted digital and parametric design courses for architects and was nominated a team leader in Solar Decathlon competition. In 2014, he taught parametric design studios with an emphasis on Biomimicry and structural design at the Arab Academy for Science, Technology and Maritime. Research interests include biomimicry design approach, responsive skins, generative design, sustainability, passive design, and healthcare therapeutic design, in particular for Alzheimer’s. Professional experience in architecture practice spans over three years of working in consulting offices; Dar Al-Handasah and Arab Consulting Engineers. At the moment, Mina is pursuing master’s degree at the German University in Cairo, and founding his own virtual design lab which goes through different design phases of project completion ranging from schematic design to design detailing and architectural presentation. Mohammed Ezzat is an architect Graduated from Cairo University. He worked as a senior architect at the GUC since its foundation. Then He became the technical manager of al-Rehab extension, Sabbour Consultants, managing a project that exceeds in cost 1.6 Billion EGP for two years. After that He made semi detailed design proposals for two biggest buildings here in the GUC, namely The German School (6200 m2/floor) and The Business park (8500 m2/floor) . Two of which were permitted and the construction documents were issued. He participated in international architectural competitions, some jointly with the biggest architectural firms in Egypt, some got recognition. Please check his website www.me-archs.com for more details. Ezzat is interested in parametric architecture. He held a lecture in the GUC then open-to-public lecture at Cairo University presenting his parametric architectural competitions. Parametric techniques widen the selectivity during the experimentation phase and offer certain qualities that would be otherwise very hard to achieve. His master's thesis will partly focus on describing the physical world of architecture using parametric techniques. He participated in many masters’ and PhD thesis using grasshopper, some of which are published in Germany (Architectural Facades). Mohamed Abedo is a teaching assistant at Architecture and Urban Design program. He is a graduate of Urban planning and design department, Ain Shams University (2014). Also, he is a postgraduate student at the same department. Mohamed is interested in studying people’s perception about cities and how the urban form affects it, he participated in several workshops and competitions addressing that issue. He also had a previous professional experience working as a landscape architect participating in local and international projects. Abedo is interested in education development and interaction among students; He was the president and one of the cofounders of the first architectural student community in Ain Shams University (FEDA Society) responsible for managing and organizing student-to-student workshops, events and local and national student competitions. Mostafa is a teaching assistant in the Architecture and Urban design Program at the German university in Cairo, Mostafa graduated from the Faculty of Engineering Ain- shams University (2013) major of Architecture and a minor of Architectural design with a graduation project grade Excellent, He has previous experience in teaching in The American University in Cairo and The Future University in Egypt having teaching experience in many courses; Architectural design studios, Building Technology courses and Computer applications courses. Besides, he has experience as a professional architect, he worked on various architectural design projects, several construction sites and had internships in multiple International architectural firms during his university study. His research interests include parametric design, environmental design, day- lighting, building skins, architectural passive design techniques, parametric environmental simulation, environmental building retrofitting, green architecture. Nada Adel is a teaching Assistant in the visual design department at the Architecture and urban design program at the German university in cairo . she has recently graduated from the German university in cairo from the same program , Faculty of Architecture Engineering . Her Bachelor topic was to redesign the German embassy in cairo ( construction of New chancellery and Residence ) . she continued with her pre-masters within the urban design program . During the university years , she trained at two different companies as an architect in hyder consulting and dubai municipality in Dubai , UAE and was a junior teaching assistant in visual design at the GUC . Her Research interests include lighting art and design and its effect in space in which she is mainly considering in her further research for the masters as well as building skins and urban design /landscape projects . Noha Salama is a teaching assistant in Urban and Architecture Department under Architecture and Urban Design Program at German University in Cairo. She completed her BSc in Architecture and Urban Design in 2015 at German University in Cairo. Her Bachelor topic dealt with innovative sustainable social housing in New Cairo where she created new design solutions focusing on Row housing typologies with humanitarian interior spatial qualities. Research interests include housing typologies and creating internal spatial qualities based on human needs. Her ambition is to have a study fulfilled with ideas based on humans every day needs and how to make a better living quality through housing typology and internal spaces. Rehab Ayman is a teaching assistant in Visual Design Department under Architecture and Urban Design Program at German University in Cairo. She completed her BSc in Architecture and Urban Design in 2015 at German University in Cairo. Her bachelor topic dealt with innovative sustainable social housing in New Cairo where she created new design solutions focusing on Row housing typologies with humanitarian interior spatial qualities. Work experience include working as an intern in Shehayeb Consult and TAKWEEN. Research interests include influencing human behavior through public space design and urban sociology, work that has direct relation to the social impact on the community. Salma Belal is an architect and teaching assistant in the Visual Design Department in the Architecture and Urban Design Program at the German University in Cairo. She completed her BSc in Architectural Engineering and Environmental Design in 2012 at the Arab Academy for Science, Technology and Maritime Transport in Cairo. Prior to her involvement with the GUC, Salma worked as an architect on various intervention projects related to urban upgrading & participatory-based architecture, where she was involved in co-organizing and participating in community workshops, carrying-out research field work and proposing design solutions. Research interests include socio-cultural norms of behavior in the built environment, visual culture and representation, and spatial analysis of perceptions of the city. Kessba is currently a teaching assistant in the Architecture and Urban Design Program in the German University in Cairo. She has recntly graduated from the same program. As a high achiever in her batch, among a select few, she conducted her Bachelor Project in the University of Stuttgart under Prof. Helmet Bott, in the Institue of Urban design and city planning. The project focused on the redesign of a central and sensitive park in Stuttgart that would be built up. Later, she has also specialized in her pre-mastetrs within the Urban Design Track. Throughout her studies, Kessba has been very fond of and has excelled at the art of physcial modelling and the parametric manipulation of form. Many of her university projects have been steered towards this dual interest. And they remain interests for her further research. Professionally, Kessba has been exposed to diverse experiences within the Egyptian architectural scene. She has participated as an intern in both the state of the art consulting environment at ECG and within the more participatory and focused approach at Dina Shehayeb Consult. Sara Samy is a teaching assistant in the Architecture and Urban Design Program at the German University in Cairo. In 2014, she obtained a M.Sc. in Architectural Engineering from Ain Shams University. The thesis focus was analyzing the Egyptian context of green architecture practices to determine potentials and obstacles of applying green architecture principles in Egypt in order to pave a better way towards applying these principles in Egypt in the near future. She obtained her B.Sc. in 2008 from Ain Shams University with a Very Good grade with honor degree. Her work experience includes working in architectural firms in addition to working as a teaching assistant in Arab Academy for Science and Technology (AAST) and German University in Cairo (GUC). Shaza Ayman is a teaching assistant at the Architecture and Urban Design Department at the German University in Cairo. Shaza graduated from AASTMT’s (Arab Academy For Science, Technology and Maritime Transport) architectural engineering program in 2014. On the side of her studies, she trained at a renowned architectural firm in Qatar where she participated in both large and small scale projects. Research interests include vernacular architecture, biomimcry and sustainable architecture. She is also interested in communal development and housing projects for the less fortunate. She is passionate about exploring different ways of incorporating recycled waste into the building process. Shaimaa Fayed is currently in the academic career of Architecture and urban design program at German University in Cairo as teaching assistant. She completed her MSc in Hybrid environmental studies from Faculty of Engineering, Cairo University. Her master title was “Hybrid ventilation in office buildings – ventilated double”. She graduated from Faculty of Architectural Engineering, Ain Shams University.